Since I haven't posted any reviews or giveaways in a little while, I thought today would be as good a day as any to do both! But enough about my upcoming races. Let me tell you all about this sweet running belt! Earlier this winter (when it was still really winter and not magically 70+ degrees in the DC Area), I was contacted by SLS3 and was sent one of their new SLS3 Dual Pocket Run Belts in exchange for an honest review. 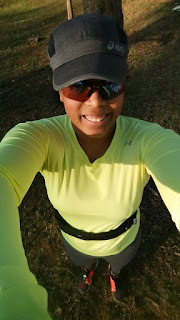 Since it was still snowing and all that wintry stuff, I was not all about that running-outdoors life (despite some decent intentions). Eventually, of course, it warmed up, so I got a chance to take the belt for a few runs and put it through the test. What Do I Look for in a Running Belt? I am a sucker for a good running belt. The more I can fit into a belt without it affecting my run, the better. Moisture wicking is a plus, as are reflective accents. I like to not have to fiddle with my belt while I'm running, and I usually listening to my jams while I run, so I need to be able to pop my headphone cable through the belt. Can the belt store snacks/gels/waffles? Is the belt comfortable? Does it bounce when I run? Does it have a slot for water? Will it hold my phone? Will I have to remove my Otterbox case before putting my phone in the belt? These are all important questions I ask when I try out a new running belt. 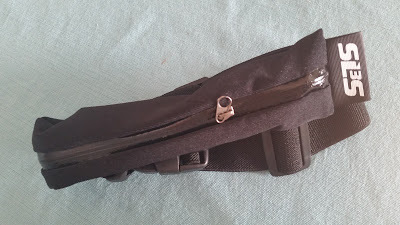 Does the SLS3 Dual Pocket Run Belt Meet My Expectations? Overall, I would say yes, I recommend the belt, and it meets or exceeds most of my expectations. I really don't like running with a water bottle in my hand, so it was a bit of a bummer that this one didn't allow me to carry a water bottle on the belt. (My hands get clammy, which is not ideal for carrying a water bottle!) It's not the end of the world, but it's a nice-to-have. I don't typically carry water on short runs, so this would be really great for that. Without a doubt, the size of the items the belt can hold really surprised me! I thought it was just this flimsy little belt that could maybe hold some gels or chews, but I was definitely wrong! I read a couple of other reviews and saw that people were fitting their cell phones in their belts. I decided to give my big ol' phone a try, and it worked! The best part was that I didn't have to remove my Otterbox cover before shoving it in there! The material is super stretchy, and I strategically positioned my phone so that I could have my headphones plugged into the jack and still have my phone secured. Now, I don't know what some of the Amazon reviewers are talking about, because I had no problem taking my phone out to snap a few pictures, which I usually don't even do when I'm out for a run. I was able to remove my phone while I was running, find a good spot for a photo, stop, take the photo, continue running, and stick the phone back in the pocket. Since the two pockets are so stretchy, I decided to stick all kinds of things in there. I was able to fit a Honey Stinger Waffle in that bad boy, along with some gels and even my car key. Even though I got sweaty on the run, nothing inside the pockets saw a drop of sweat! The pockets are lined, on top of being moisture wicking, so they just handled my sweat like a boss! The funniest thing about trying out this belt was that I actually forgot I was wearing it the first time I took it for a run. Really! Once I adjusted the belt, I didn't have to mess with it again, and it was so comfortable, even when I was driving (whoops), I forgot it was on! I definitely recommend this running belt, and l cannot wait to put it to good use this race season! Now, on to the giveaway, which I'll be linking up with Running with SD Mom and Erica Finds as part of their Wednesday Giveaway Roundup. 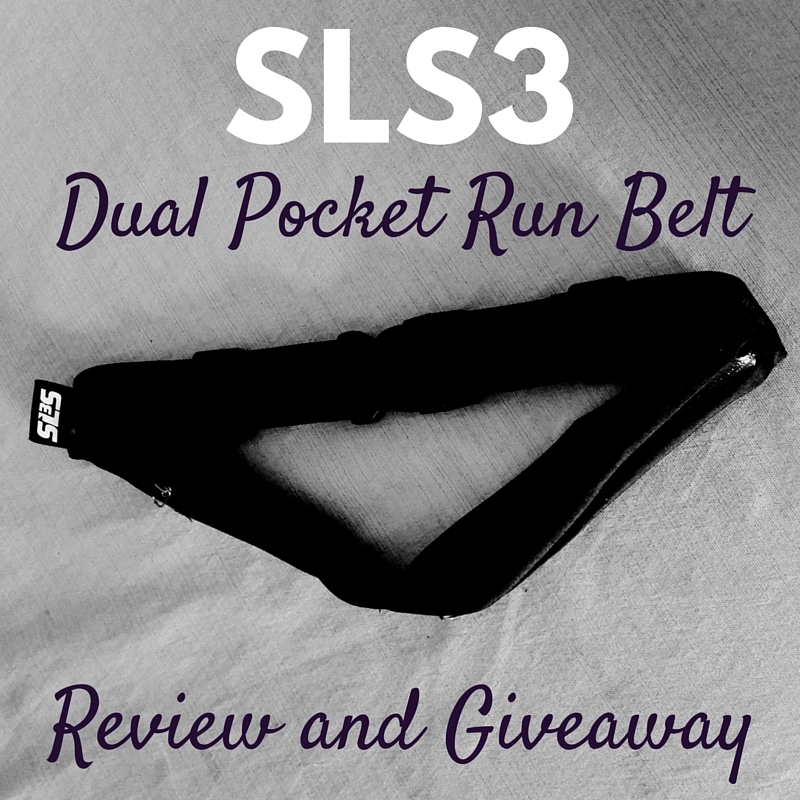 Fill out the Rafflecopter widget below to enter for your chance to win your own SLS3 Dual Pocket Run Belt. Hurry! The giveaway closes next week when SLS3 will pick a random winner! Can't wait for the giveaway results, and need to buy your own? For a limited time, you can purchase an SLS3 dual pocket belt on super sale! The belts normally retail for $29.90, but the Amazon store has it listed for $12.90 with Amazon Prime as of my writing this post! If you're interested in other SLS3 goodies, such as those super cute compression sleeves I was giving away a few months back, check out their website, and be sure to use the code BLOG40 to receive 40% off on their website. Did I miss any running belt requirements? What do you want out of a running belt? Do you like to carry water while you run? I love running belts. I currently use the flip belt and love it but this one look great too! I think this belt looks great and I'd love to try it out on a run...my phone is huge so I wonder if it could fit! I usually carry water when I run, and used to wear a hydration belt. But once I got pregnant I switched to a handheld bottle and haven't made the switch back yet. Ah I'd love this for when I get back to being able to run within the next month! Sounds like a great belt! I tried one that had a clip on water bottle, but the bottle kept falling off the belt! Do you know of a good one where the bottle stays on? I love the dual pocket design. The belt I currently use has only one pocket and I'm always worried my phone will fall out when I'm trying to get my gu. Overall, I would say this could be making a gift worth its value to persons with my special difficulties... Through research I would highly recommend the belt, and it meets or exceeds that of what appears but I'd love to request that in the future a water bottle holder be added for I have the use of just one hand.